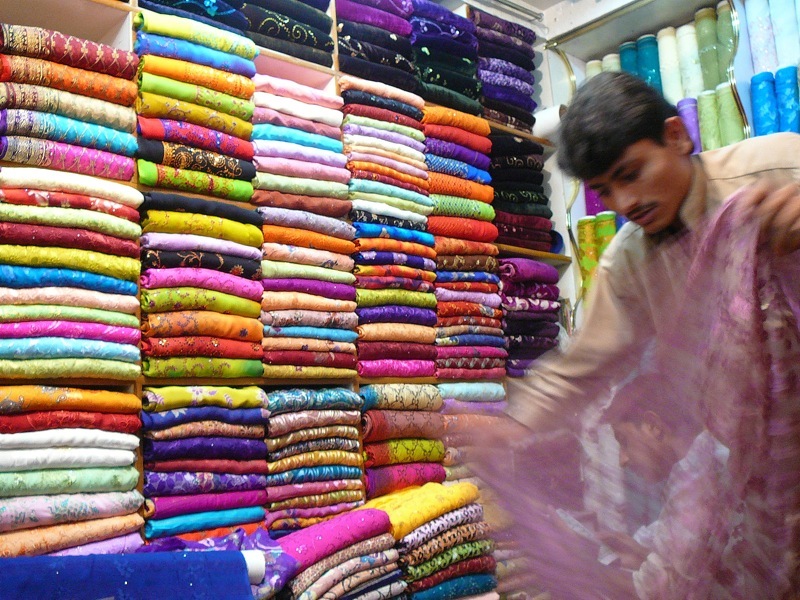 The shopkeeper unrolls a bolt of cloth to tempt us. It works. 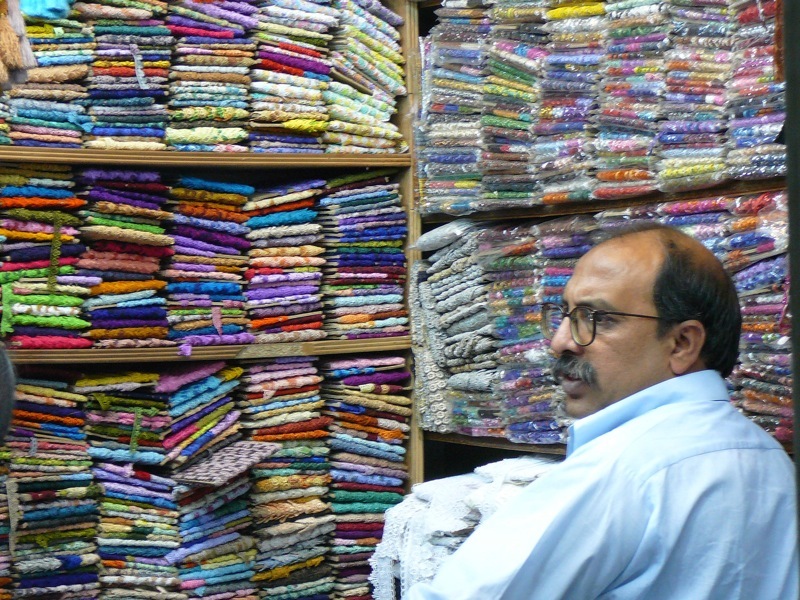 It’s almost a requirement of a trip to any South Asian country that one visit the cloth markets. Until very recently, there were no shops where a shopper could simply choose a style and size and pick an outfit, ready to wear. 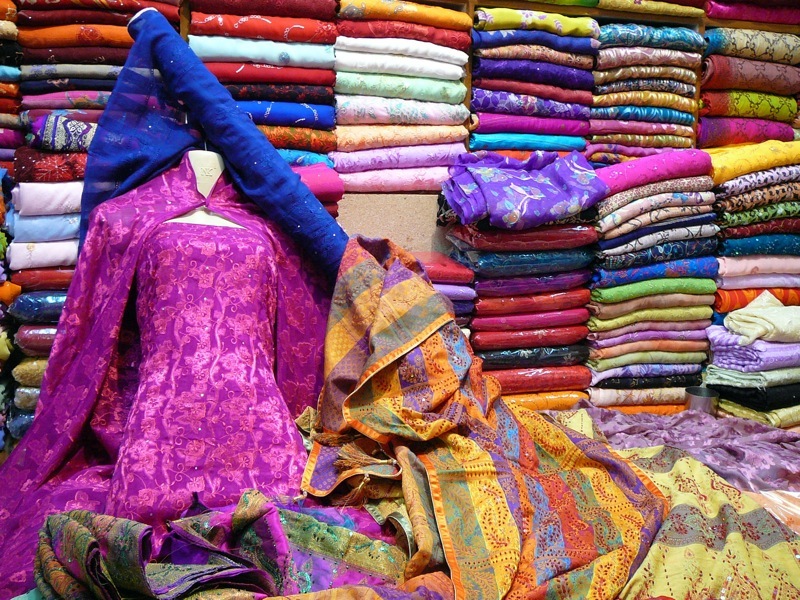 The traditional and, in my opinion, most fun way to do it, is to start from scratch and visit one of these havens of vibrant color and texture, the cloth shop. 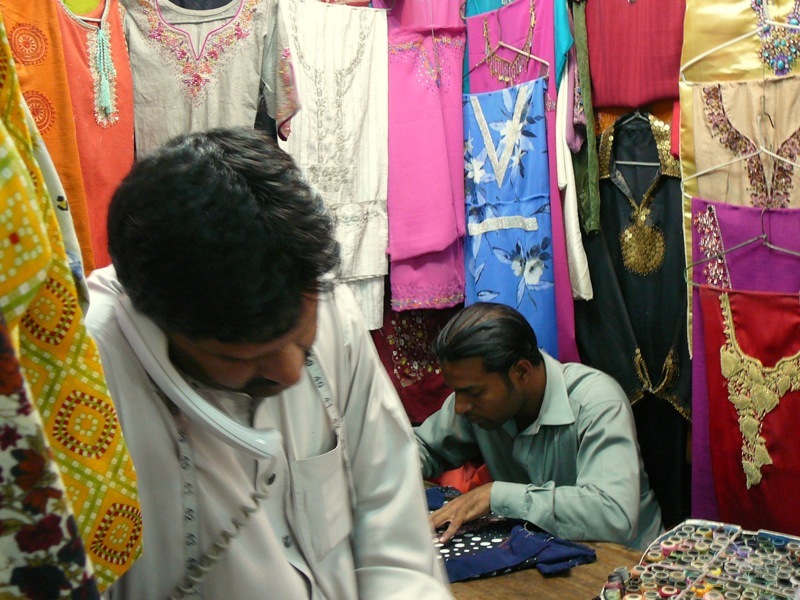 My mother and I enter China Market in Rawalpindi, Pakistan early in the morning, as soon as the shopkeepers are opening their gates. 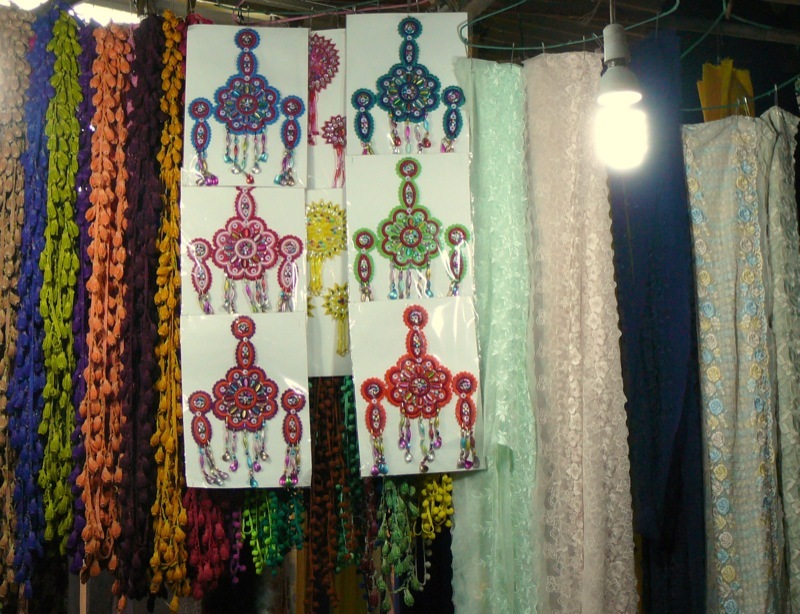 The shopkeepers are rather superstitious and believe it is bad luck to let the first customer of the day walk away empty-handed; thus, they are willing to give us better deals as we haggle on the price of cloth. Pictures are in lightbox – click one to open the gallery. As we walk by his shop, this young man calls to us. “Bari baaji! Choti baaji! Ayai na!” “Little sister! Big sister! Won’t you please come in?” As we enter and he invites us to sit, I can tell by his lyrical accent that he’s actually Afghani, perhaps a refugee that came to Pakistan a long time ago. 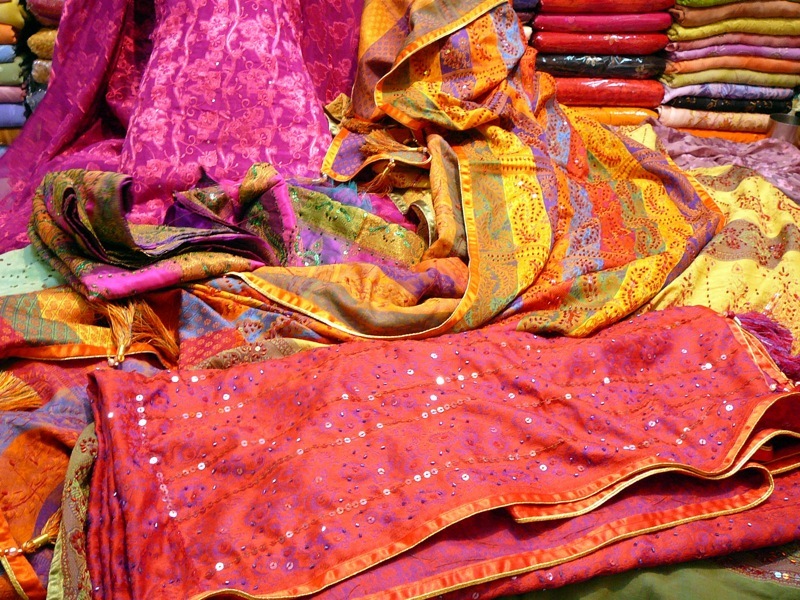 As he points out his varied wares, I can’t help but feel transported back to a time of Mughal princes and princesses dressed in their luxurious, colorful costumes. Though he can probably understand the kind of cloth we are looking for, he is determined to show us everything he can, hoping something else will catch our eyes as well. He unrolls bolt after bolt of beautiful fabric, inviting us to feel the texture, look closely at the hand-embroidered flowers and sequins in a pattern that he had specially created, just for his shop. I capture him just as he unrolls a bolt of purple “glass georgette,” so named because of its interspersed patterns of smooth satin on thinner fabric. 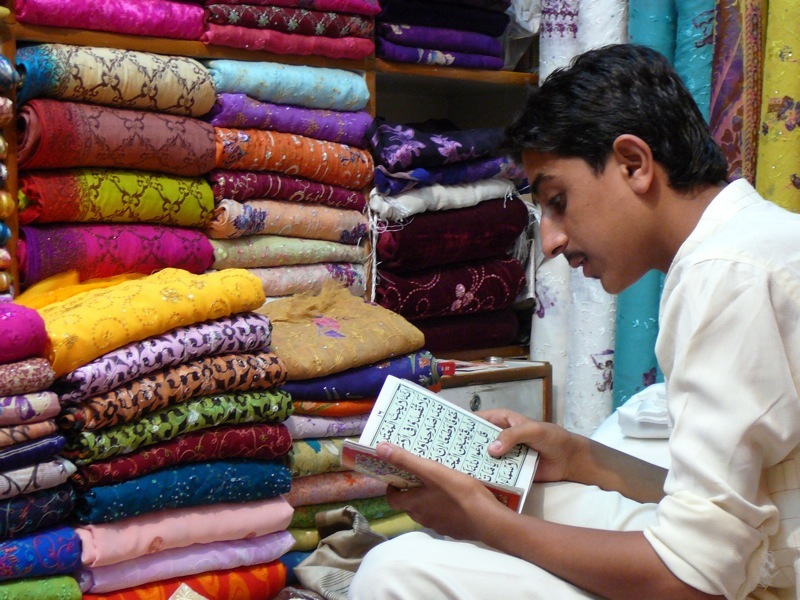 Through the opaque fabric is visible the shopkeeper’s assistant, who wanted to bring good fortune to the business by starting his day with a reading of the Holy Qur’aan. The shopkeeper’s tactic worked; my mother and I bought more than we had planned. As he folds and packs the cuts of fabric, he orders us cold sodas and asks that we remember him in our prayers. We are welcome at his shop anytime, he says, as a sister would be for her brother.